I was itching to start something new yesterday, so I decided to start The Good Huswife's "Ida Mae Crow." 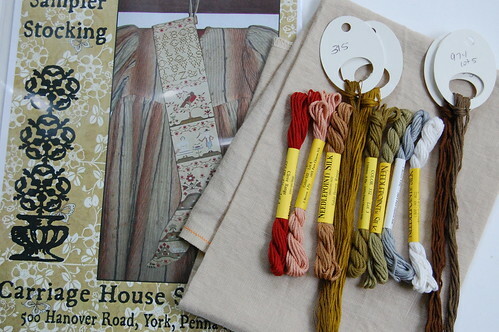 I'm using the recommend linen and threads - 35 ct. WDW Straw and NPI silks (2 over 2). I also decided to kit a few other things up. The first is Plantation Sampler. I loved Tanya's finish and I am copying her conversion of NPI silks and DMC. The fabric is 40 ct. Vintage Maritime White. She used 45 ct. I'm not that brave! I thought she did such a beautiful job with it. The second is Ellen Birdseye. I'm such a copycat because I'm also copying the colors Melissa used for her recent finish. The linen I think I'm going to use is 36 ct. Vintage Navy Bean. And last is Carriage House Samplings "Sampler Stocking." I'm joining a SAL with Annemarie and Barbara starting on the 16th. I pulled the threads and I think I'm going to be using 40 ct. Pearled Barley. edited to add: Ida Mae Crow is a new chart released recently by The Goode Huswife (she's designing again!). Wow, you've gotten so much done on Ida Mae already! I love all your kitted up stuff. Yum! Hope your son is feeling better fast. Wow, you stitch faster than lightening! Just an fyi-123Stitch now has Lakeside linen. I just ordered some last week. Their service is very fast. 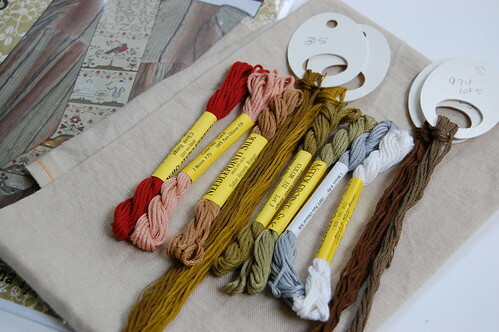 Looks like you have lots of great stitching in your future! Wow, you got a lot done on Ida Maw for just starting this. You must have smokin' needles! And I love all all your kitted projects. This should keep you busy for a while! Can't wait to see your progress on all of these!!! Ida Mae is darling!!! Great new ready to go projects! Hope DS is better soon! Great new start!!! I love everything you kitted up as well!!! Looking forward to watching you stitch them all!!! Hope your ds is feeling better soon. Them ear aches are not fun at all! Been through way to many with my DD! Ida Mae is looking good so far Nicole! I love the colour of the WDW fabric - what is it like to stitch on? Like Zweigart or Permin/Wichelt? You have a great choice of kitted projects there too, can't wait to see your progress. I'm joining the stocking SAL as well and looking forward to it. Great start and I look forward to see how your new ones go! Oh, I love your new start and you kitted up some great designs! The more I see Ida Mae the more I like it! You have a great start! Also love all of your kitted projects, you are going to be having fun! Hope your ds is feeling right as rain soon, nothing worse then an earache! What great projects!!! I hope DS is feeling up to par soon! Ooooh, those kitted projects look good enough to eat! 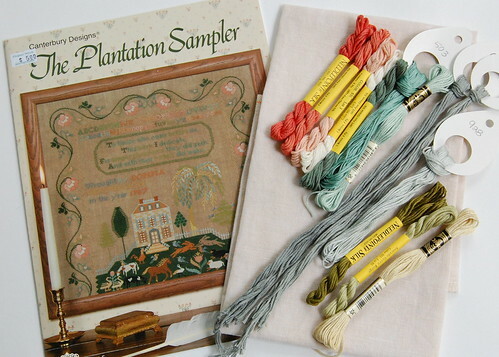 I saw Deb's Plantation Sampler, and it reminded me that it's in my stash. I may have to pull that baby out. I love Ida Mae Crow. She is so cute! You have already made a lot of progress on her. I also love all your new kits. :) I think kitting is almost as much fun as stitching. Hope your son is feeling better soon. Oh you funny girl! You just started Ida Mae yesterday, and you're almost done? Holy Smokin Needle! It looks great. 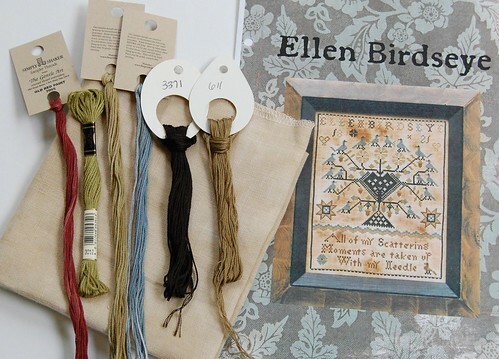 I'm happy that you liked the colour conversions I did for Ellen Birdseye. I will look forward to seeing your version. Also, I bought the Plantation Sampler too (thanks to Tanya's beautiful work). I will have to go thru her posts and find her colour conversions. You have lots of wonderful things on the go! Hope your sonny feels better soon. Ida Mae is just adorable~ Can't wait to see it finished!!!! I hope your sons ear is getting better soon! Your needle is really smokin'... can't believe how much you've stitched already on Ida Mae. Love all the new projects you've kitted up. At the rate you're stitching Ida Mae it won't be long before you have them all started. I love Ida Mae! is that chart out of print? I may need to find it and stitch her up, she is really cute! of course i couldn't stitch her up as fast as you. Ida Mae Crow looks terrific, I love this little project adn I think I have resisted long enough - I'll have to have it now. All your kitted up projects are so, so beautiful. I'm looking forward to seeing them started. 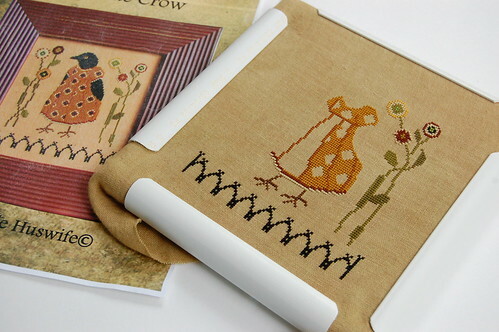 I love the Ida Mae Crow chart and what fast progress you've made! I've seen Yuko with this one finished and framed and it looks just gorgeous. I quite like the Ellen Birdseye one as well. What fun to have all those kitted projects ready to go. Can't wait to see the start of your stocking. The floss toss is gorgeous! Love this design. Where can I get it????? Would love the pattern.